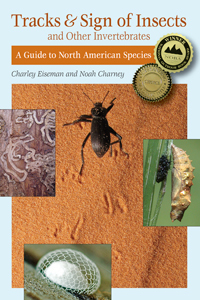 Three years ago in Noah Charney’s mother’s driveway, I spotted a long-legged insect hanging from the edge of a leaf. I wondered if I had found a hangingfly (Bittacidae), which is not a true fly but a member of the order Mecoptera, of which scorpionflies are the most common examples. Incidentally, you can tell if an insect is a true fly based on whether or not “fly” is a separate word in its name. True flies belong to the order Diptera, which means “two wings,” and include black flies, bot flies, flesh flies, blow flies, deer flies, crane flies, and so on. Hangingflies, scorpionflies, fireflies, dragonflies, mayflies, etc. have four wings and belong to other orders. 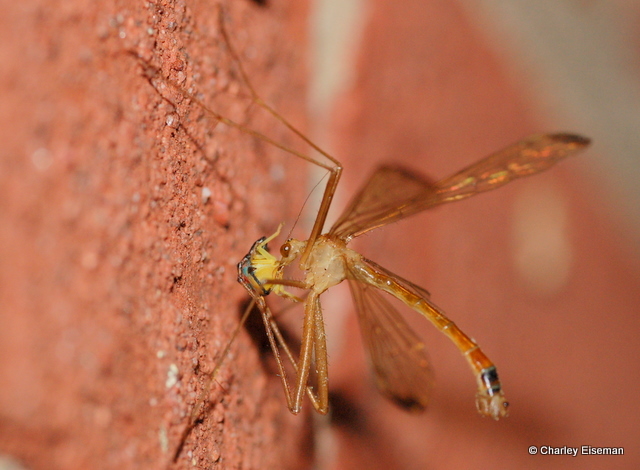 Anyway, when I posted my photo of this insect on BugGuide.net, Eric Eaton quickly identified it as a fungus gnat, which is a true fly. 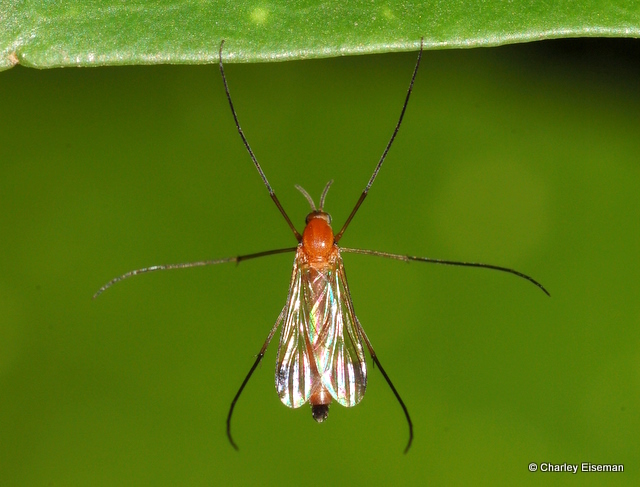 A fungus gnat (Mycetophilidae) hanging from the edge of a leaf. It turns out that some fungus gnats and related flies habitually rest by hanging spread-eagle by the tips of the two front legs. 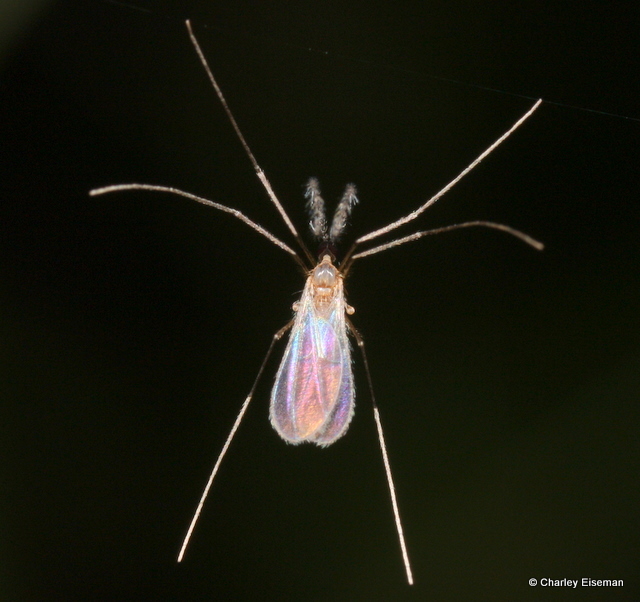 This past March, when John and Jane Balaban posted this photo on BugGuide, I learned that certain gall midges like to do so hanging from spider webs. It strikes me as a very foolish thing for them to be doing, and I’m not sure how it helps them, but it’s an interesting sight in any case. I was determined to see this phenomenon in person, and I saw my first example two months later when Noah and I were exploring Kentucky. A gall midge (Cecidomyiidae) hanging from a strand of spider silk. After Kentucky we stayed with Noah’s mother in Nashville for a few days, and one night I was taking pictures of various bugs that were attracted to her porch light. 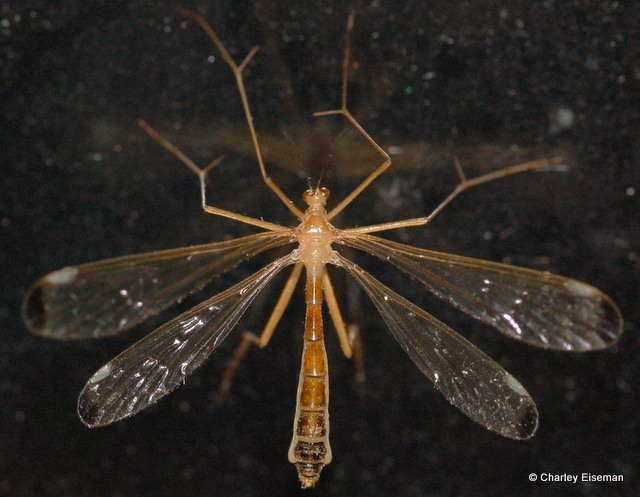 I was surprised when I saw one of the crane flies munching on a leafhopper–I didn’t think there were any predatory crane flies. And, in fact, there aren’t. When I stepped back from the tunnel vision of my macro lens, I saw that this predator had four wings–it was not a fly but a hangingfly, and it happened to be about 20 feet from the spot where I had mistaken a fungus gnat for one three years earlier. 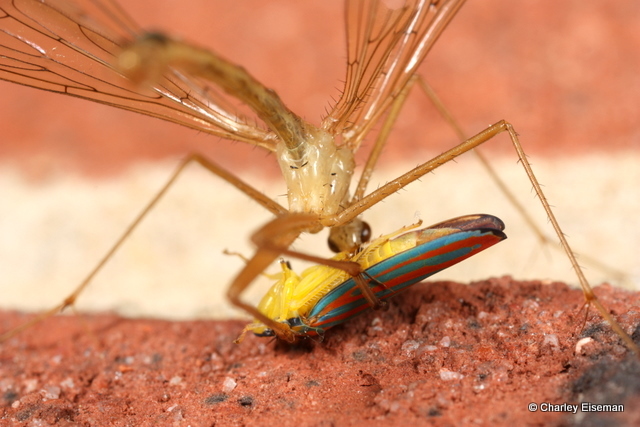 Hangingfly (Bittacidae: Hylobittacus apicalis) eating a leafhopper (Cicadellidae: Graphocephala coccinea). I got to watch this hangingfly for a while, and I saw that it was holding the leafhopper with the tarsal claws of its hind legs. When it was not feeding, it lowered its legs, and then it raised them to its mouth again when it was ready for another bite. 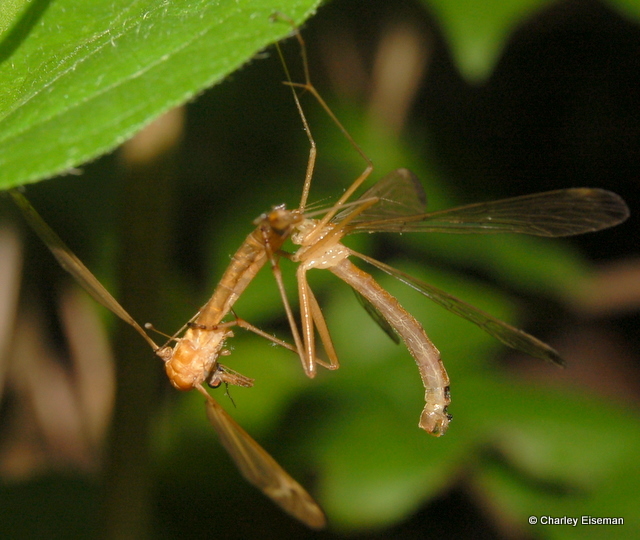 Hangingflies use their feet to capture prey, but instead of swooping down like raptors they just hang there and grab whatever flying insect comes within their reach. When I looked up to the eaves, I discovered that there were a number of hangingflies hanging there. Whereas most of the insects I was photographing were there because they were confused by the light, the hangingflies clearly were not at all disoriented and were there to take advantage of the abundance of prey. Interestingly, the hangingfly page on BugGuide states that this species, Hylobittacus apicalis, is diurnal (only active in the day). When I was reviewing my photos from this spring, I found out that I had actually seen my first hangingfly the day before. 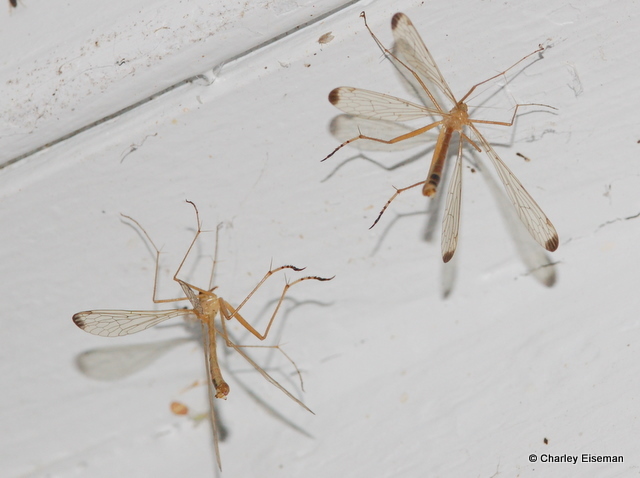 I had thought I was taking a picture of a mating pair of crane flies; I remember noticing that they seemed to be in a strange position, but they had flown away before I could get a good look at what was going on. 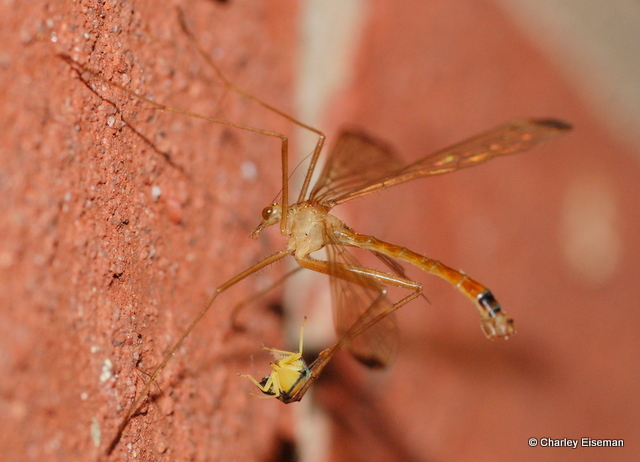 In the picture below, it is clear that I had actually seen a hangingfly devouring a crane fly. Hangingflies don’t really bear much resemblance to the fungus gnat shown at the top of this post, but maybe you can see how one would look like a crane fly at first glance. Hangingfly (Bittacidae: Hylobittacus apicalis) eating a crane fly (Tipulidae). 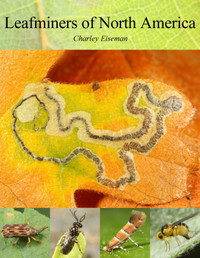 This entry was posted in Uncategorized and tagged Bittacidae, Cecidomyiidae, Cicadellidae, crane fly, Diptera, fly, fungus gnat, gall midge, Graphocephala coccinea, hangingfly, Hylobittacus apicalis, leafhopper, Mecoptera, Mycetophilidae, Tipulidae. Bookmark the permalink. Terrific pictures! Especially getting those leafhoppers.